In these times of packed schedules and unprecedented stress, multivitamins and other supplements are staples of a healthy lifestyle. Yet, many people still are not taking a daily multi or giving one to their children. Why not? Perhaps they are listening to outdated advice. Some nutritionists and physicians still feel that we can get all the nutrition we need from food. But who eats a perfect diet? The ideal diet would require us to buy fresh produce every day, prepare the meal ourselves, and eat it slowly to maximize digestion and assimilation of nutrients. But processing, storing, and even cooking can impact the vitamin and nutrient content. Chemical fertilizers, pesticides, and soil conditions can also adversely affect our food. Finally, think about how many cars you see lined up during meal times at the fast food drive-up window. We know today’s diet is not ideal. Research suggests that even people who consume a nutritious diet still fall short on intake levels of key nutrients at the end of the day. Most of us do not meet the Recommended Daily Allowances (RDAs) of many vitamins and minerals—and those RDAs are based on amounts needed to prevent deficiency diseases, not on amounts needed to maintain optimal health. 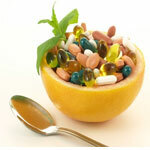 A multivitamin/mineral can help fill in any nutritional gaps from a less-than-perfect diet. Having optimal levels of certain micronutrients is known to reduce the risk for and the severity of chronic diseases and to optimize immune function. A daily multi can help to ensure the health of future generations, too. Case in point: the well-known connection between adequate folic acid and a reduced risk of birth defects such as spina bifida. Studies show that some school-aged children who take multivitamins perform better on IQ tests than children who do not take multis! Children need vitamin E and B vitamins for brain and nervous system development, vitamin D and minerals for healthy bones and muscles, and antioxidants to help strengthen their immune function. There are a number of factors to consider when choosing a multinutrient formula. Thousands of published studies support the link between adequate vitamin/mineral intake and reduced risk of disease. The difficulty is knowing which nutrients are most important and how much of each nutrient to take. Let a multivitamin/mineral do the work for you. A good multi will contain at least 100 percent of the RDA for most nutrients. Make sure the vitamin E is natural source, not synthetic. (Hint: synthetic vitamin E will be listed as dl-alpha tocopherol.) Choose a multi formulated for your particular needs. For example, prenatal vitamins will contain more folic acid. Children’s formulas will have just the right amount of the nutrients kids need most and are available in chewable varieties.